Politician and art-collector; died in 1854. 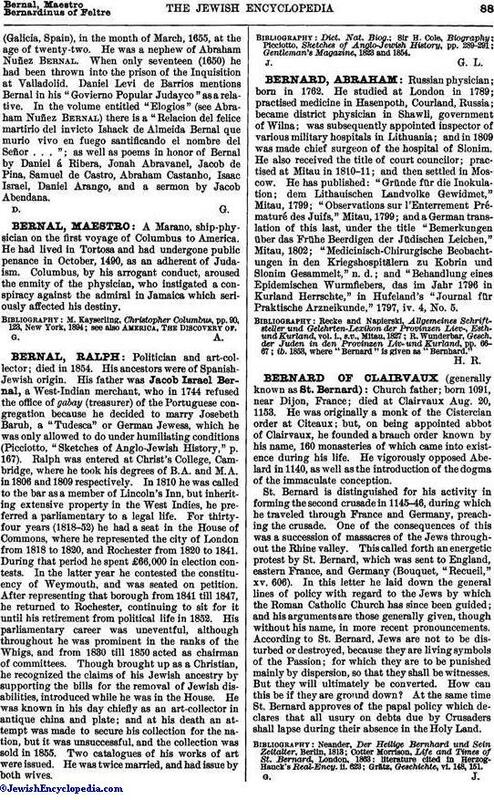 His ancestors were of Spanish-Jewish origin. His father was Jacob Israel Bernal, a West-Indian merchant, who in 1744 refused the office of gabay (treasurer) of the Portuguese congregation because he decided to marry Josebeth Baruh, a "Tudesca" or German Jewess, which he was only allowed to do under humiliating conditions (Picciotto, "Sketches of Anglo-Jewish History," p. 167). Ralph was entered at Christ's College, Cambridge, where he took his degrees of B.A. and M.A. in 1806 and 1809 respectively. In 1810 he was called to the bar as a member of Lincoln's Inn, but inheriting extensive property in the West Indies, he preferred a parliamentary to a legal life. For thirty-four years (1818-52) he had a seat in the House of Commons, where he represented the city of London from 1818 to 1820, and Rochester from 1820 to 1841. During that period he spent £66,000 in election contests. In the latter year he contested the constituency of Weymouth, and was seated on petition. After representing that borough from 1841 till 1847, he returned to Rochester, continuing to sit for it until his retirement from political life in 1852. His parliamentary career was uneventful, although throughout he was prominent in the ranks of the Whigs, and from 1830 till 1850 acted as chairman of committees. Though brought up as a Christian, he recognized the claims of his Jewish ancestry by supporting the bills for the removal of Jewish disabilities, introduced while he was in the House. He was known in his day chiefly as an art-collector in antique china and plate; and at his death an attempt was made to secure his collection for the nation, but it was unsuccessful, and the collection was sold in 1855. Two catalogues of his works of art were issued. He was twice married, and had issue by both wives. Gentleman's Magazine, 1823 and 1854.